the boo and the boy: a genius idea! This morning, my sister sent me this link to lifehacker. The article discusses how the average American family of four throws out an estimated $130 to $175 in uneaten or spoiled food every month. CRAZY but true. And that is alot of money. 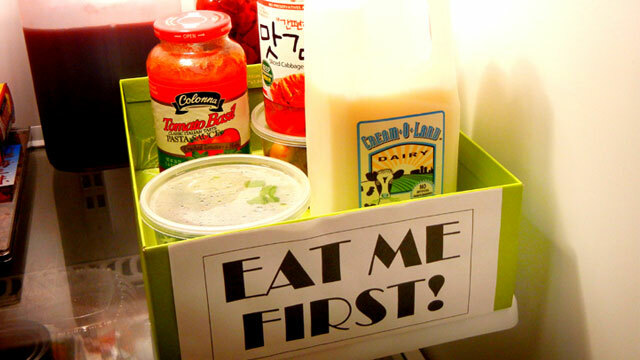 As you can see in the photo above, they recommend creating a fridge triage box that puts in plain sight and gathers in one place the foods you should reach for first. I am totally going to do this as soon as I can find an empty shoebox. What a good idea! I've been trying to eat up leftovers before I go grocery shopping. It sickens me to throw away food. I wonder what the stats are for foods wasted by Canadian families. I tend to think Americans waste more than anyone else in the world. Roberta - I'm tired of throwing food away too so I hope this works for us. Hollie - I try to eat all the leftovers at our place. Pablo is not a big fan of leftovers so it is usually up to me to eat them. I usually take leftovers to work for lunch. I bet Canadians are just as bad as Americans for wasting food. It is very nice to have met you. You´ve got a beautiful blog full of inspiration. very nice! Love your blog! Thank you so much Tatiana and Hege!